A practical and convenient package of three supersoft short-sleeved bodysuits with envelope neck and snaps to make nappy-change superfast! 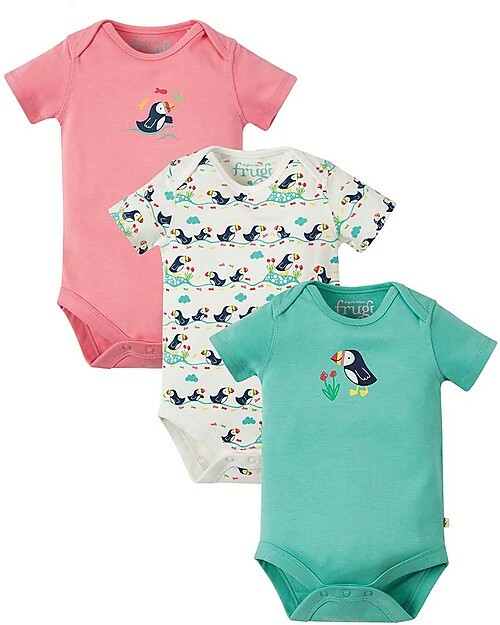 Made by Frugi in a classic 100% organic cotton, these bodysuits are guaranteed free of harmful chemicals, safe for the most delicate skin, even when there is a risk of dermatitis or eczema. Also designed with an ample fit to comfortably accommodate washable cloth nappies, they are eco-friendly. 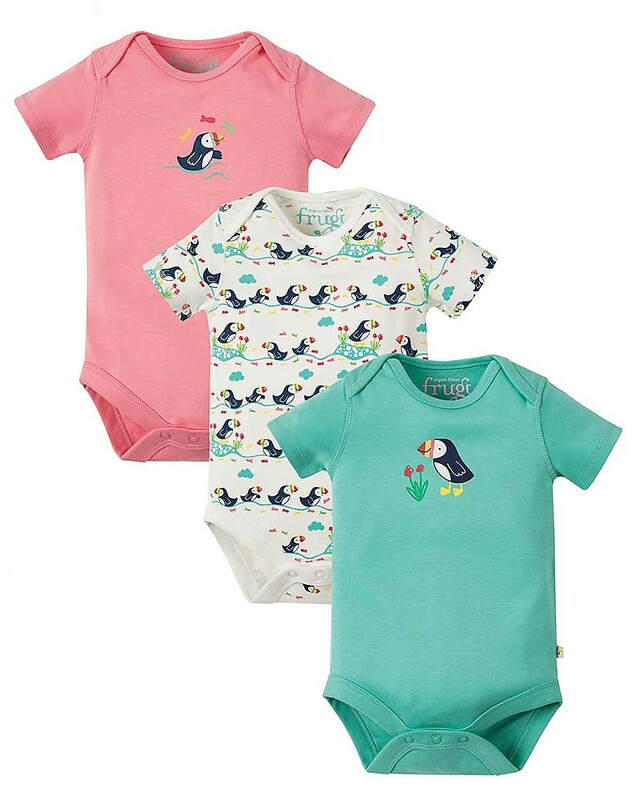 Perfect with any outfit, these bodysuits are a must have for layette and hospital bag and ideal to pair with the other Frugi’s pieces from the same range. The Frugi brand is the undisputed leader in organic cotton clothing for newborns and children. Winner of many prizes awarded by the industry, and the favourite of many European families, Frugi produces clothes that comply with the international GOTS standards and SA8000. 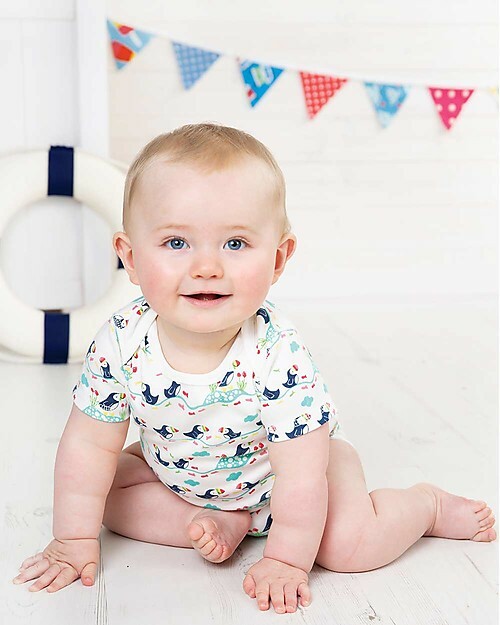 From Babygrows to Bodies to Socks to Bibs.... all Frugi clothes are colourful, comfortable and fun to wear, as well as being hard-wearing and eco-friendly. All phases of production are guaranteed Organic, without the use of pesticides and chemicals which could harm your child’s skin, as well as the workers who produce the garments, and the environment. Fairtrade production in accordance with the SA8000 standard for ethical and social responsibility which guarantees respect for basic human rights, including those of children, and assures health and safety in the workplace, acceptable working hours and remuneration (including medical coverage for workers and their families). Frugi packaging is made out of potato starch (non GM) that is biodegradable and can go straight into your compost heap! Frugi's big vision is to be the most desirable and trusted kids clothing brand on the planet. Yes, we know the planet's a big place, but Frugi is a fast-growing brand with loads of ambition! It's all about scrumptious organic clothes that you just have to have because they're so gorgeous! And not only do these clothes look delicious, but everything is made from ethically sourced organic cotton too. Our organic clothes now go from newborn to 8 years cheeky, with a range of breastfeeding wear as well.